Are you old enough to remember watching this cartoon on TV? Topper, the man who had ghosts living in his house. They’d been killed in a car accident, and needed to do more good deeds before being allowed into heaven. The theology was pretty weak, but it was a fun show. Topper, of course, was the only one who could see and hear the ghosts. Many funny situations were created on that simple theme. These were two of my earliest memories of ghosts. Happy, helpful souls. It wasn’t until I saw A Christmas Carol on TV for the first time that I realized not all ghosts were benign. I was about eight, I think, and the movie was very old, black and white–probably the first movie ever made of Dickens’ classic tale. I had weird dreams on that Christmas Eve night! I don’t believe in ghosts either. But you say, ‘you are grounded in biblical truth’, didn’t Jesus come back, as a ghost? During the resurrection? It wasn’t His ghost, in the sense that we think of people who have died and have stayed dead. It was Jesus in His spiritual form, visible only when He chose. He did not stay dead. That’s what makes Christianity unique in the history of religion–it is the only one that offers a Savior, crucified to bear the sins of all mankind, buried, and risen again. The confusion may stem from the King James Version’s translation of the Holy Spirit as the Holy Ghost. Yes, I thought of that too I think it’s an unfortunate translation, but I guess “ghost” and “spirit” can be used interchangeably in some situations. Maybe “ghost” had a different connotation back when the KJV was being put together. I need to add this: I speak from a perspective of personal faith, not dogma I was force-fed. I don’t use this blog as a forum for debate, and I try not to be intrusive with my faith. At the same time, I’m not going to hide it. But I won’t debate it. I remember Casper and I sort of remember Topper. 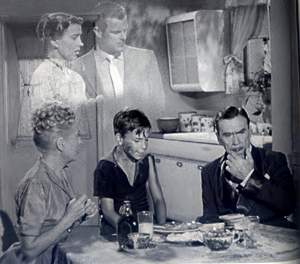 Do you remember The Ghost & Mrs. Muir? I don’t believe in ghosts either but sometimes irrational thoughts like that intrude on my mind.